There is much discussion in education and psychology about the need to "develop the whole child" (see Kalinowski & Jordan, 1973). But what exactly does that mean? In order to answer that question one needs to have some view of the nature of a human being, the innate potentials to be developed, and the purpose of this life. The concept of "Becoming a Brilliant Star" is designed to address these issues as a guide to developing home- and school-based curricula for parents, educators, and others responsible for developing the capacities of children and youth. The basic approach stems from process and systems philosophies (e.g., Laszlo, 1996; Rescher, 2002); the underlying paradigm emphasizes a need to focus on the formative processes in each of the multiple domains of human development (Huitt, 2006), thereby recognizing the nobility of each human being. The development of the Brilliant Star framework was heavily influenced by such researchers as Benson, Galbraith and Espeland (1994), Chickering and Reisser (1993), Ford (1987), Gardner (1983, 2000), Heath (1980, 1991), and Jordan and Streets (1973). The Brilliant Star graphics shown below focus attention on three critical issues facing young people today: vision, competence, and moral character. Vision has to do with aspirations, dreams and goals of what is possible and desirable to do (Philip-Jones, L., 2002; Pfeiffer, 1989). The framework is intended to incorporate a long history of thinking and research on what it means to be human, especially in terms of multiple domains of a human being's potential for development. Competence concerns the knowledge, values, attitudes, and skills that link to successful performance. One purpose of the Brilliant Star framework is to integrate different perspectives on a variety of domains of human potentials or capacities. Moral character deals with the habits or patterns of thinking, feeling, willing, and behaving that relate to right and wrong, to justice and equity, and to morality and ethics. An important concept is that moral character is built upon, and must be integrated with, competencies developed in other domains. All three issues are intertwined and difficult to isolate (Mustakova-Possardt, 2004), although from an analytic perspective these can be observed and studied separately. Therefore, a major purpose of the Brilliant Star framework is to highlight domains of human potential and describe best practices that can facilitate the development of potentials or capacities into competencies. The Brilliant Star framework can be summarized by stating that children and youth need to develop competencies, acquire virtues, and provide service to others. Competencies are considered as actualization of innate and inherited potential, while virtues are considered as habitual use of those competencies. It is recognized that each individual is heavily influenced by one's sociocultural milieu and positively influencing that milieu facilitates one's own and others development. It is, therefore, the goal of teachers and parents to prepare children and youth who are good, smart, healthy, and socioculturally well-integrated. Seligman (2011) described this goal as one of attaining high levels of well-being or flourishing. The framework is comprised of eight core domains plus the domain of citizenship. 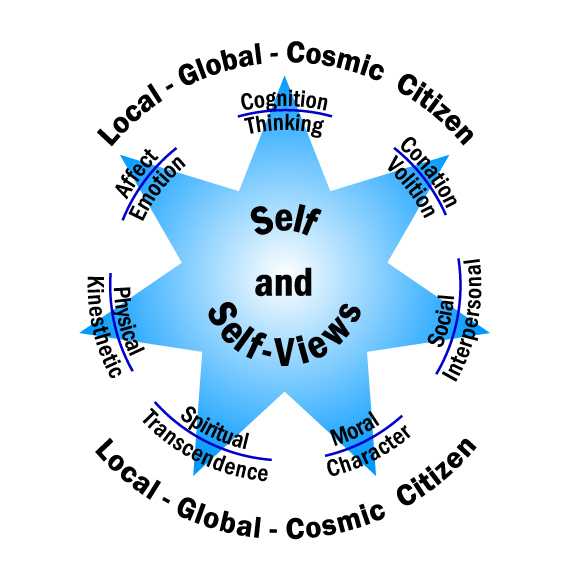 The core domain is self and self-views with the other seven seen as specific aspects of that general domain. Style involves all of the personality, temperament, learning style, and other ways that help us define our uniqueness. Finally, social refers to human relationships and making friends while moral character refers to the underlying qualities of a person's moral or ethical knowledge, attitudes, values, and commitments that are systematically displayed in one's behavior. Character is associated with the quality of one's life, especially in terms of moral and ethical decisions and actions. It is in these nine domains that one is expected to develop competence. 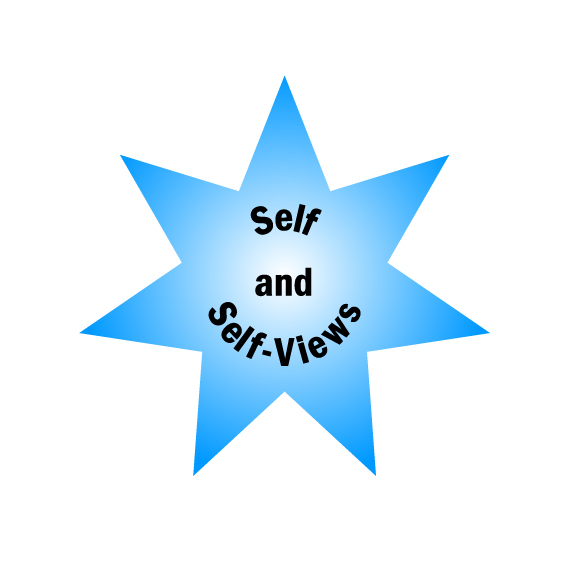 As previously stated, one's self, self-views, and personal style are placed in the middle of the star as they are considered central to learning and development in all domains. In reality, any of the elements or domains could be placed in the middle of the star as all are connected to each other. It is simply a matter of what to emphasize. Vision relates to all ten domains and the two core elements in that one's ideas about possibilities and desires leads one to set goals and strive for excellence in each area. Some synonyms for Brilliant Star as discussed here might be champion, spiritual or celestial warrior, hero, servant leader, or even giraffe (one who is willing to stick his or her neck out.) This is the opposite of someone who accepts being average or mediocre or sees himself or herself as a failure or loser. It is important to acknowledge that the more internal domains of physical, cognitive, affective conative, spiritual, and moral character development are actualized in interaction with the more external domains of social and citizenship. For example, in adolescence one's development in the competencies necessary to start and maintain one's own family and the other external domains are heavily influenced by one's cognitive, emotional, and conative development. The reverse is also true; as one develops in the more external areas this impacts competency in one's internal domains such as problem solving strategies and values. The Brilliant Star framework also recognizes that the nine domains are developed in interaction with social and cultural influences (Bronfenbrenner, 1979). The interaction among the different people, beliefs, institutions, etc. form the social capital of the child represent that influences human development and behavior (Coleman, 1988; Putnam, 2000). At the first level are the family, the school, the religious organizations, and friends or peer groups. At a more macro level, the influences include such areas as the culture, international region (such as NAFTA), and the global conditions. These influences are filtered through the micro level influences. 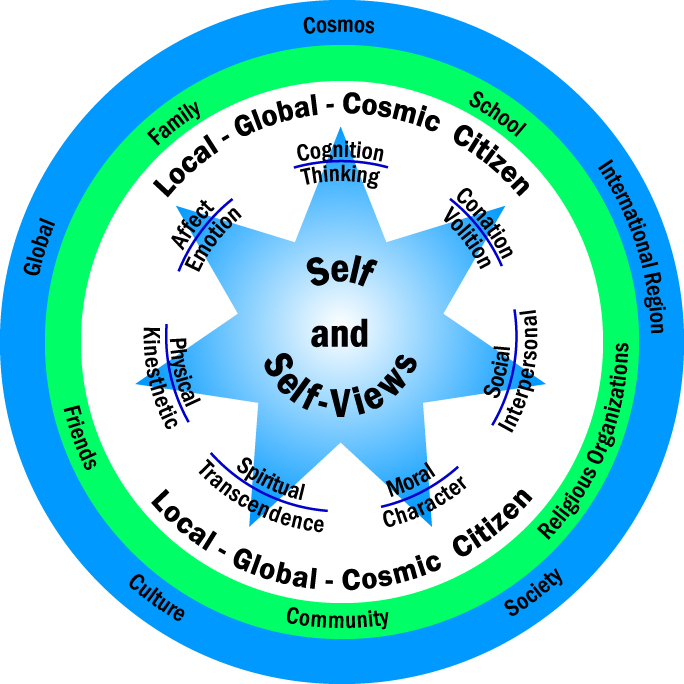 Abrams and Primack (2011) make the case that cosmic citizenship should be the orientation that is taught to children and youth as that forces everyone to recognize a personal connection not only to earth, but to the entire cosmos. Four fundamental principles guide the development of the Brilliant Star concept and the selection of materials shown below. First, there is no single source of knowledge about what it means to develop human potential should be used to define how to "Become A Brilliant Star." Science, religion, philosophy, history, literature, and the arts each addresses different issues, provides different data, and has different standards by which to judge perceptions of reality or the validity of concepts and principles. For example, history tells us what happened in the past while science identifies the concepts, principles, and laws that govern what happened. Religion provides a vision of what is possible in the future and the moral code necessary to achieve it. The arts express history, science, and religion in creative and expressive forms. Philosophy provides the organizing constructs that show the possibilities of connections among ideas and there related meanings as well as potential logical gaps or inaccuracies. Each of these can provide standards by which we can judge alternatives of how to develop human potential. The small sampling of links to materials shown below demonstrates the unity, as well as the diversity, among different sources of information as it relates to human growth and development. Second, the concept is being developed from a "systems" or "organismic" perspective (Huitt, 2000; Lazslo, 1996; Whitehead, 1978). From this viewpoint, the individual is seen as a self-organizing, emerging system existing in a homeodynamic relationship, both internally and externally (Yates, 2002). That is, internally, the individual is simultaneously addressing spiritual, physical, cognitive, affective, social, etc. issues and needs. Externally, the individual is influencing and being influenced by the natural, social, and cultural contexts in which one lives. Bandura's (1986) concept of "reciprocal determinism" and Bronfenbrenner's (1979) concept of "the ecology of development" capture the idea that individuals both influence and are influenced by their environments. For example, the paradigms or world views held by member's of a society and taught to children and youth are the road maps used when they become adults and participate in building the society in which they and their children will live. Sternberg's (1994) view that intelligence (or the capacity to learn) is shown when the individual is influenced by environment, when influencing the environment, or when selecting a more appropriate environment to meet one's needs or desires makes this same point. The systems view is compatible with the most modern of scientific paradigms (e.g., Capra, 1996; Lazslo, 1996) as well as several divine philosophies (e.g., De Chardin, 1989; Savi, 1989; Whitehead, 1978). Third, human beings are considered as spiritual beings, a belief fundamental to all major world religions, as well as many philosophers and scientists (e.g. Templeton & Giniger, 1998). The sacred writings of the different faiths are an important source that can be used to develop the knowledge base for a vision of what excellence would look like in each domain. Philosophers have been discussing issues of spirituality from ancient times as exemplified in the writings of Socrates and Plato and history has documented the success of many historical spiritual and religious figures. A tremendous amount of wisdom from these sources has been amassed over thousands of years of human history. Science is a relative newcomer to this process in that the writings of scientists span a little over a hundred years about what it means to be human. Despite the attempt to justify a totally materialist view of human beings by many important scientists such as Einstein (1941) and Jung (1933) have rejected this view. A fourth principle is that success in any venture is the result of first developing a vision of what is possible, developing written goals to achieve that desired outcome, taking action and assessing results, and finally, reflecting and making adjustments until desired results are achieved or new goals developed. The concept of W.Y.M.I.W.Y.G. (What You Measure Is What You Get; Hummel & Huitt, 1994) is central to this process. What one focuses on through assessment and measurement becomes the end result one strives to achieve, whether it had been previously stated it or not or even if some other result had been set as a goal. Stated another way, human beings grow towards what they focus on through assessment and measurement. It is absolutely critical that systematic assessment of progress on multiple dimensions is done as educators (including parents, teachers, community leaders, etc.) assist young people in their multidimensional growth process; otherwise energy will continue to put into a single dimension such as academic achievement in basic skills as measured by standardized test scores. While this single measure might be important, it does not capture the full-extent of what it means to be human or to fully develop one's capacities. There are a variety of materials on this site related to developing vision and competence in each of these domains and core elements as well as on the conditions for that development. Selecting the appropriate term below will link to materials from religious scripture, philosophical discourse, individuals in history who have demonstrated excellence in a particular area, or writings from a perspective of science. The intention is to work towards the development of integral wisdom regarding human development and behavior. Of course, additional sources such as those derived from the arts and humanities should also be included, but I will leave that to others to elaborate. One can begin to implement the "Becoming A Brilliant Star" framework right away. Download the Brilliant Star graphic (pdf format) and assess yourself. The terms provided will help you identify where you are now in each dimension. A description of how I use this in a classroom setting (pdf format) is available. What does my star look like now? What would I like it to look like? Decide where you are now and where you would like to be in each of these areas. Then select one or two areas for concentrated attention. You might want to develop a vision statement and mission statement as part of a process to think about your priorities. In addition, Waitley (1996) advises imagining what your life would be like if time and money were not an object in your life. That is, what would you do this week, this month, next month, if you had all the money and time you needed and were secure that both would be available again next year. Write down 100 items that you would like to achieve during your lifetime. Next, set some one year goals and some immediate goals and write them down. Take some action everyday as you work to complete your goals. Develop an affirmation statement that you can repeat daily to help you stay on track. Make a checklist, start a journal, dialogue regularly with a mentor, or do something similar to hold yourself accountable to achieving your goals. You might also start each day with a "Thought for the Day" exercise that will help you focus on the qualities necessary to become a Brilliant Star. As we start a new century, there is wide-spread belief that we must alter the schooling and education of our children and youth (Huitt, 1999). A variety of educational programs have been developed to address the important concerns of vision, character, and competence. One problem with most educational programs is that they focus on only one goal (e.g., high academic test scores or character development) to the exclusion of other important desired outcomes (e.g., emotional stability or self-regulation). Additionally, the foundation of the majority of these programs has been based on a limited range of principles identified through philosophy or science. Unfortunately, many of these programs have been a disappointment to their founders. One reason may be that the programs were not founded on the best information provided through scientific investigation and research. However, another reason may be that the programs were founded ONLY on the principles of science. Fundamental truths offered by spiritual or religious teachings of the major world religions, philosophers, historical figures, authors, artists, or other important sources were perhaps ignored or not utilized. Since vision and morality are fundamental to all religious teachings, the omission of insights from religious scripture is likely significant. However, since science has discovered many principles related to learning and development that are not intuitively obvious (see Slavin, 2003), using only an alternative source such as religious scripture or philosophy and not using the scientific method to develop educational programs is equally difficult to justify. The purpose of the materials at this site is to begin to remedy this deficiency. The materials are intended to be used to develop courses and programs of study that will allow the knowledge base developed through science (e.g., see the course materials for a graduate-level course in Educational Psychology), religion, philosophy, history, and the arts to guide the holistic development of the education and training of young people. A formulation of objectives that can be addressed in a PreK-12 environment has been developed to provide some initial structure for developing methods, materials, and evaluation of core elements and domains. As an example of how academics can be combined with the development of attributes in the other domains, a webpage is being developed that provides links to lesson plans focusing on both academics and moral character. A reading project is also under development that addresses how multiple academic objectives and Brilliant Star objectives can be simultaneously addressed in classroom learning activities. Bandura, A. (1986). Social foundations of thought and action: A social-cognitive theory. Upper Saddle River, NJ: Prentice-Hall. Benson, P. L., Galbraith, J., & Espeland, P. (1994). What kids need to succeed: Proven, practical ways to raise good kids. Minneapolis: Free Spirit Publishing, Inc.
Capra, F. (1996). The web of life: A new understanding of living systems. New York: Doubleday. Chickering, A., & Reisser, L. (1993). Education and identity. (2nd ed.) San Francisco: Jossey-Bass. De Chardin, P. T. (1989). Divine milieu. New York: HarperCollins. Ford, D. (1987). Humans as self-constructing living systems: A developmental perspective on behavior and personality. Hillsdale, NJ: Lawrence Erlbaum Associates. Gardner, H. (1983). Frames of mind: The theory of multiple intelligences. New York: Basic. Griffin, D. (Ed.). (1990). Archetypal process: Self and divine in Whitehead, Jung, and Hillman. Chicago: Northwestern University Press. Heath, D. (1980). Wanted: A comprehensive model of healthy development. The Personnel and Guidance Journal, 58(5), 391-399. Heath, D. (1991). Fulfilling lives: Paths to maturity and success. San Francisco: Jossey-Bass. Jung, C. (1933). Modern man in search of soul. [trans: Cary Baynes]. Orlando, FL: Harcourt. Laszlo, E. (1996). The systems view of the world: A holistic vision for our time (Advances in systems theory, complexity, and the human sciences). Cresskill, NJ: Hampton Press. Pfeiffer, J. W. (1989). Shaping strategic planning: Frogs, dragons, bees, and turkey tails. Glenview, IL: Scott, Foresman & Co.
Savi, J. (1989). The eternal quest for God: An introduction to the divine philosophy of ‘Abdu'l-Bahá. Oxford: George Ronald. Slavin, R. (1997). Educational psychology: Theory and practice (7th ed.). Boston: Allyn-Bacon. Sternberg, R. (1994). In search of the human mind. New York: Harcourt Brace. Templeton, J., and Giniger, K. (Eds.). (1998). Spiritual evolution: Scientists discuss their beliefs. Radnor, PA: Templeton Foundation Press. Waitley, D. (1996). The new dynamics of goal setting: Flextactics for a fast-changing world. New York: William Morrow. Whitehead, A. N. (1978). Process and reality: An essay in cosmology. New York: The Free Press. [Originally published in 1929].